There is no formal specification for a Mirror dinghy Bermuda mast. 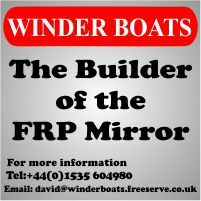 This article offers some guidance to mast manufacturers who are interested in making Mirror masts. Mirror Mast manufacturers do not need to be licenced, so anyone (including DIY enthusiasts) is free to make masts. The only formal document is the class rules which specify some details such as permitted materials, minimum and maximum cross sections, measurement datum point, position of black bands, position of shroud & forestay attachment, height of spinnaker halyard hoist, spinnaker pole fitting projection and a list of permitted fittings. Below I've documented some additional information with the intention of bringing a new manufacturer up to speed. As with many other classes, there is no "right" answer to most questions regarding Mirror masts. Developments continue and fashions ebb and flow over the years. When Mirrors were gaff rigged, the standard Gunter mast on a racing boat in the UK was a 2" (50.8mm) diameter tube with 14 S.W.G. (= 2.030mm or 0.0800 inch) walls. 16 S.W.G (=1.630mm or 0.0640 inch) wall masts were available but widely regarded as being too flexible for anyone other than lightweight helms and crews. When the Bermuda rig was introduced, sails and other rig details (such as no spreaders) remained unchanged, so the Gunter mast experienced should carry over to the Bermuda mast up to the hounds. In the UK the Superspars M9 section is very popular and won the 2011 World Championships. This is a pear shaped section and is tapered above the hounds with the weld along the forward edge. According to the Superspars website it is also used on International Cadets, International 2.4m and Snipes. 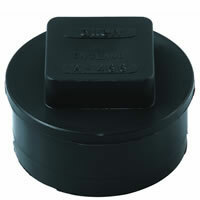 It has with dimensions 64 mm X 53 mm, weighs 0.905Kg/metre and has a "stiffness rating" of 28. It's generally regarded as being a little too stiff for a lightweight helm and crew. The other Superspars offering is the MHA section which started life as the Holt "Aldebaran" section. This is a more oval section, untapered, 48 mm x 58 mm and weighing 0.848Kg/metre. This has had some success with Emma and Martina Barry using one to win the 2008 UK Nationals. Matt and Ben Lulham Robinson also used this section in their early years before moving onto an M9 section as they got bigger. When Bermuda masts were introduced, Selden started offering their "lambda" pear shaped section which was tapered above the hounds. According to the Selden online catalogue it is 63 mm X 51 mm, 0.88Kg/metre, stiffness fore and aft is 13.64cm4 and athwartships is 9.8cm4 . It was generally regarded as being a little too stiff for most weights. When the class rules where changed to allow a sleeve, Selden started to offer their 2420 section which is a 50mm round with a track as part of the extrusion. This section is also used on International Cadets. Weight is 0.78 Kg/metre, stiffness fore and aft is 10 cm4 and athwartships is 7.5 cm4 . Initially these were untapered, but more recently I've seen a tapered version with two welds down the sides. They are sleeved internally, but I don't have any details. Hawk Marine Products "Needlespar" masts are quite popular in the UK. They offer a 50mm round tube section with a track rivetted on the back. Above the hounds the tube has a thinner wall and is often anodized a different colour. Internally there is a machined alloy joining sleeve which allows the two different internal diameter tubes to be joined together. Craig Bond from Brightlingsea in the UK has produced a small number of Mirror masts when he was working for Z-Spars. These were 50mm round tube with a taper above hounds and anodized black. They were pre-bent to the maximum permitted in the rules before the track was rivetted on the back. 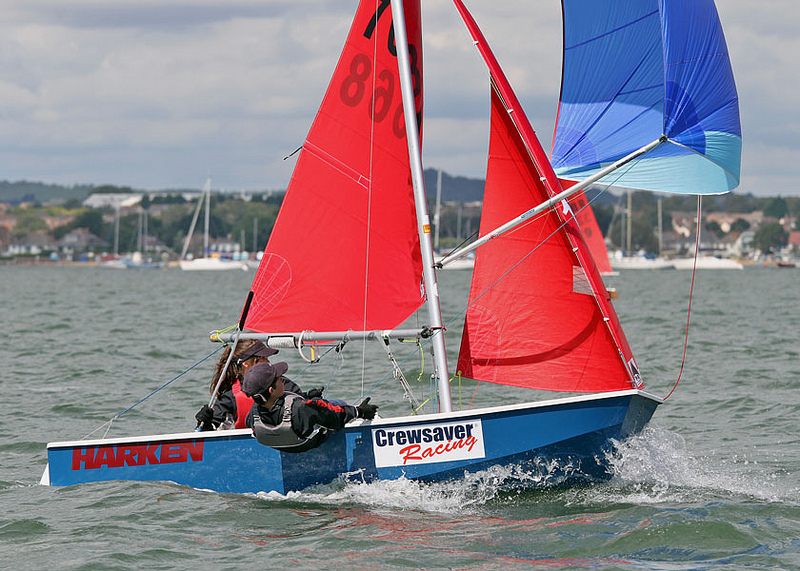 They were popular with sailors from Brightlingsea winning the 2008 European Championship and 3rd at the 2011 Worlds. Trident-UK produce a Bermuda mast which up to the hounds is a 50mm tube with a track glued on the back. Above the hounds a smaller diameter tube, also with a track glued on, is slid inside the bottom tube and secured with a bolt. This allows the mast to be disassembled for transportation. These masts are really aimed at the crusing market rather than for racing. In Australia Goldspars make a Mirror mast which I understand is based on their Flying 11 GTD5015 section, so 50 mm tube with 1.5 mm walls and an internal sleeve. It has a spun conical top above the hounds. Such a mast was placed 2nd at the 2011 World Championships. 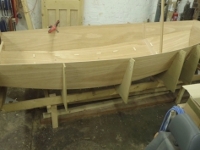 Also in Australia Mark Phillips of Dinghy Sports is working with a spar maker producing something similar to a Goldspars, but cheaper. It has a 50 mm diameter, 2 mm wall, bottom section with a 1.2 mm wall tapered tip. Class rules limit the height of the mast step, so currently in the UK a fitting such as the Allen Brothers A.466 heel plug, which fits a 47mm Inside diameter tube and has a 29 mm X 29mm tenon is almost universally used. 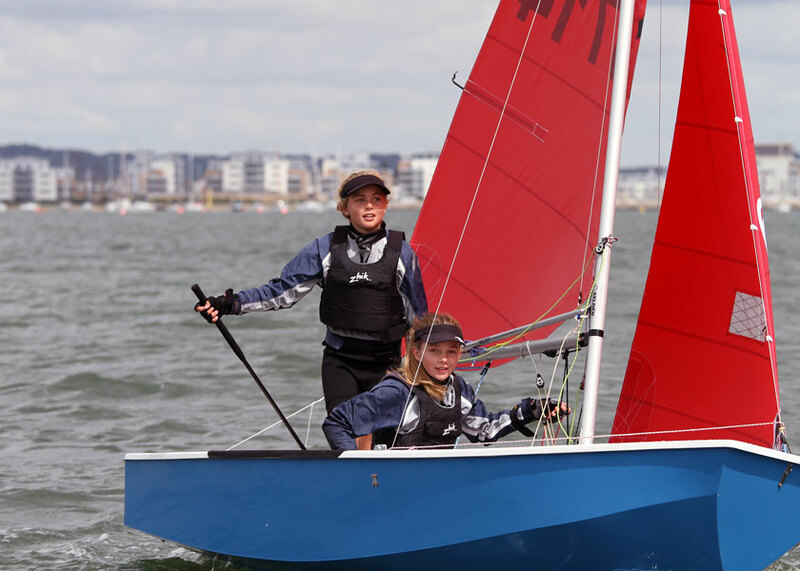 This fitting is also used on International Cadet dinghies. 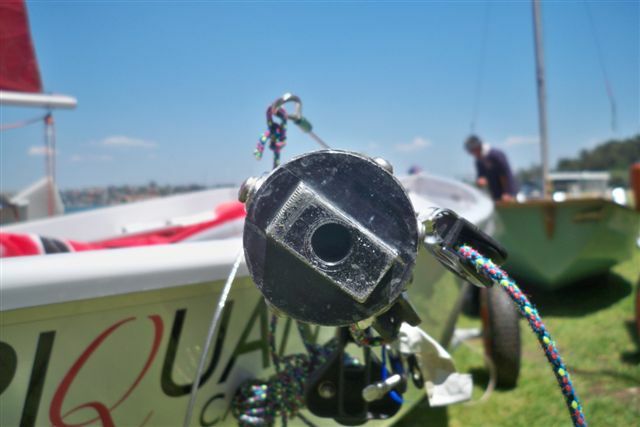 In Australia Goldspars use a metal fitting with a retangular tenon. All the one piece masts are rigged internally with halyards and spinnaker pole uphaul running over sheave boxes etc. The position of main halyard sheave is determined by the position of the black band in the rules. The jib halyard sheave box is normally just below the forestay attachment. The position of the spinnaker pole uphaul sheave box is not constrained by class rules. Similarly the position of the spinnaker pole eye is down to sailor choice. Small children using end to end gybing will struggle to re-attach the pole to the mast when it it windy if the pole eye is too far above their heads. On the other hand, having it higher gets the pole more horizontal which projects more sail area. Most manufacturers exit halyards through slots and then use clamcleats for jib and main halyards (must be below the gooseneck, no halyard locks) and the spinnaker pole uphaul. The spinnaker halyard normally runs down to a turning block on the stowage bulkhead and then back towards a cleat on the aft edge of the daggerboard case. In the UK "T" terminals are universally popular and the way of attaching the shrouds and forestay to the mast.